We see all kinds of cool cosplay, but sometimes a costume really grabs your attention because it is so exceptional. Well, this is one of those and it also will grab you by the heartstrings and shake you up. 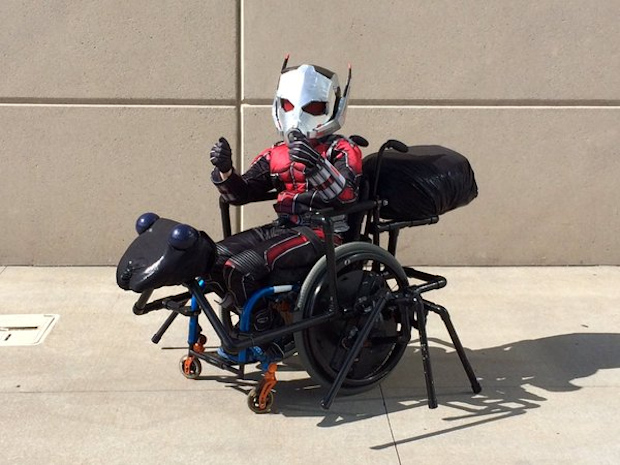 This Ant-Man and Antony costume was made by the people behind Walkin’ & Rollin’. If you’re not familiar with these guys, Walkin’ & Rollin’ makes costumes like this for kids with special needs, free of charge. Basically these folks are awesome, and super talented too. They really have outdone themselves with this wheelchair costume. And you know this kid was having the best time of his life that day too. It is absolutely perfect. This wins the internet for the week, so I’m taking the rest of the day off and going home.